The last time I read a book reviewed by Stephen King (of whom I am long time follower and fan) I barely made it a third of the way through the book. “Mr. King!” I despaired, “You lied to me! !” So having seen that his was the review that was emblazoned on the back of this book, I was a little dubious and hesitant to begin reading. Once bitten, twice shy and all that. He mentioned that it was ‘a mix of Michael Crichton and Shirley Jackson.’ Shirley Jackson (again a follower of) eh? We’ll see…. However, Mr. King has fully redeemed himself in my eyes, as this book is indeed a cracking read. 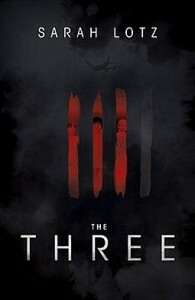 Sarah Lotz’s The Three (published by Hodder & Stoughton in hardback at £14.99, OUT NOW) is a fascinating book that tells a huge tale albeit with very few words and does indeed have a Shirley Jackson-esque ending that leaves you with a smirk, a frown and a lot of potential philosophical discussion points. So what’s it all about then? Four major air disasters, over four different continents, with three sole survivors – all three of whom are children. What’s interesting about the plot is that they are not actually the main feature, despite their uniqueness, and their subsequent actions and behaviours. The book concentrates more on the theories that spring up surrounding the three survivors, with the three (again, nice touch) main theories being; rational explanation, eschatology and aliens. The narrative is told predominantly through transcripts of technical reports, conversations, interviews and Skype sessions. As a result I initially found it quite difficult to connect to the book but just as I was about to give up (and get Mr. King’s number to give him an earful) something changed and I was suddenly engrossed. There is a swift pace between each entry and whilst you are reading the latest one your imagination is filling in all that has happened in between – because there is no other option but to do just that! It’s fascinating to find your brain being cinematic in its thoughts while simultaneously registering what’s unfolding subsequently and by the time you finish the book you have to replay the whole thing from a different perspective.